because i'm old and like the terminal in dark colors. Thank you very much for the Spanish translation Nilson! I'm very sorry for this late reaction. I've been away from the forum for several months, due to health issues. I'll add your translation file to the first post. See the first post in this thread for details and downloading. Finally, what took you so long? Thank you very much for the German translation L18L!!! Anyway, thanks again. Much appreciated! That's a neat little trick. Never saw it before. BTW, in Seamonkey it's: Preferences > Appearance > Content > "Zoom only text instead of full pages." Let us hope for help from nice forum members. No problem, was only pointing out that it's Preferences > Appearance > Content >""
Thank you! This option is only visible when the menu-bar is enabled (ticked). For some reason the menu button (in recent FF) does not have everything the menu-bar has. Yes, maybe in another thread? We've gone completely off-topic in this thread...luckily it's "mine" and I am the cause of this derailing. Subject description: translation files moved from first post to unclutter it. All translations will be published here. Oops, the pWget.desktop file is missing from pWget-0.9. Apologies. Here's a stop-gap solution, the attached PET. It will install the missing file and nothing else. Meanwhile I found some small, but irritating bugs in pWget. 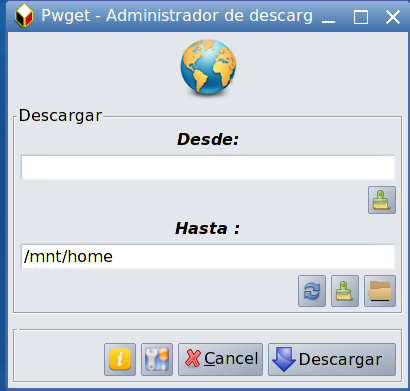 Description a stop-gap solution for pWget-0.9 users to have pWget in the Internet category of the menu. For downloading please see the first post. * Overriding the default destination folder from start window works again. * Better handling of URLs that end with "/download"
Some sites have the -bad- habit of appending "/download" to the URL. An example: "http://sourceforge.net/projects/sevenzip/files/7-Zip/9.38/7z938-src.7z/download"
This is a nuisance as the downloaded file will be called "download" in stead of the file name "7z938-src.7z"
I hope I will be able to solve this somewhere in the future. For now, in Multi, just remove the "/download" from the URL(s), before hitting the "Download" (or Enter) button. I got a question from someone who liked the gtk theme I'm personally using and wanted to know what theme it is. The theme is called 23oz. I forgot its origins...it has been in my collection for years. I've attached it here, in case more people are interested. See the pWget help page for 23oz screenshots. * highlight 23oz, click "Apply" button and "OK" button. Subject description: "less is more"
i'm happy to announce a new pWget! I restarted from scratch and used YAD in stead of gtkdialog. The result is a light-weight, fast and easy downloader. This version 0.9.4 is a test version and will become 0.9.5 when everything is proven okay. So i will not post 0.9.4 in the first post. A short presentation can be found here. EDIT Oct.17: Please see next post for the updated version!